Schuyler Museum – Burlingame Historical Preservation Society, Inc. The Schuyler Grade School now the Burlingame Schuyler Museum, was built in 1902. The first classes began in January 1903, and it served as the community grade school until the close of school in May of 2001. The original school was a two-story, four room brick building with a basement. The school was named for Philip Schuyler, owner of the property when it was given for the site of the first courthouse of Osage County. He was one of the 1855 settlers of the community called Council City, later renamed Burlingame. In 1955 a one-story addition was added to the west, making the school ten rooms, which included two rooms in the basement of the original building. The detached community center building was added in the 1980’s and was used as a classroom, lunchroom and gymnasium area. It had kitchen and bathroom facilities as well. Today the museum features eight rooms of exhibits reflecting Burlingame’s history and a research room, including the fire station exhibit in the community center that houses the Burlingame Fire Department’s pride and joy, their 1938 fire truck. Displayed are the extensive arrowhead collections of Robert “Swede” and Shirley Masters, a hobby they both enjoyed for many years. Also featured are other Native American artifacts from the surrounding area. Education has always been a priority in the community. The first school in Osage County was taught by 13 year-old Louisa Todd in 1855. The school memorabilia gallery is filled with trophies, photographs, a simulated one-room school, a school quilt made by students in the 1930’s and much more to reveal the story of local schools over the years. Many enjoy the class photos of past classes of Burlingame High School as they stroll the main hallway. As the rural areas of the county became settled, country schools were built so children living outside the towns could receive an elementary education as well. There were eventually ninety-seven country schools in the county, three of them two-room schools. Exhibited is the stage curtain from the Superior School which was built in 1894. Superior School is located two miles south of town and another example of the area history. Other exhibits demonstrate the rich history of farming, mining and railroad of the area through artifacts and photographs, as well as an extensive military collection dating back to the Civil War. 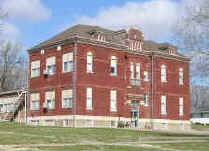 In 2011 the Schuyler Grade School was placed on the Kansas and National Register of Historic Places.